This morning my order from Boozyshop arrived on my doorstep, and with that order came a great little lipstick from NYX Cosmetics. 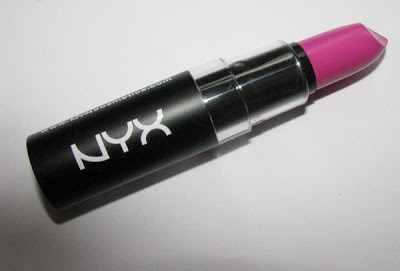 NYX is a drugstore brand from the US that specialises in affordable yet wonderful products. The other products I ordered will be seen in a haul video that I will be filming shortly after finishing this article. Now, for more on the lipstick. 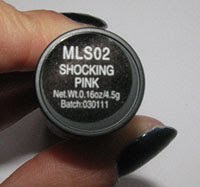 As the title already shows you, this is a matte lipstick, meaning no shine or gloss. It is hard to find a matte lipstick that isn't drying and hard to apply. This lipstick is neither. It applies wonderfully creamy and doesn't dry out my lips, but it is neccessary to wear a lipbalm underneath, because a matte lipstick will show any kind of chapping or dryness on your lips. 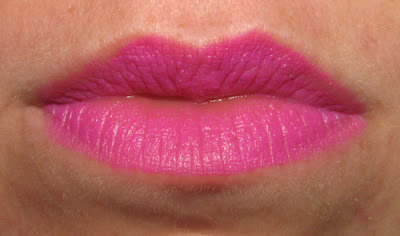 So just apply some lip balm, do the rest of your make-up and finish off by applying this gorgeous lipstick. I purched the NYX Cosmets Matte Lipstick in the colour MLS02 'Shocking Pink'. 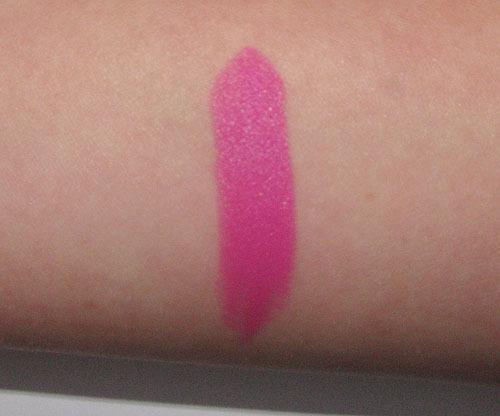 It's a gorgeous intense pink colour with a a blue-ish undertone. Look at that pigmentation! That swatch is from two barely pressed swipes across the inside of my arm. It applies like a dream, gorgeously creamy and the colour payoff is just wonderful. Just a swatch on my lips. My lips are quite dry at the moment, which shows underneath the lipstick. So make sure that you have properly moisturized your lips before applying this lipstick. As for staying power. I've worn this lipstick for three hours straight and had lunch (noodles, yum.) and drinks since then and I am still in no need of a touch up. The pigmentation is wonderful and it applies like a dream. Dutchies and people from Belgium can get this amazing lipstick (and the numerous other shades from this range) at the Boozyshop website for €5,95. A steal!